Severe symptoms can lead to life threatening collapse (anaphylaxis). A food intolerance means that the body is unable to fully breakdown, or has an inability to digest, certain foods. This can lead to symptoms such as migraines, bloating and aches and pains and can affect many systems of the body. It is not as serious as a life threatening allergy. However, symptoms can be very difficult to cope with and can affect your child's quality of life. Food intolerance is now known as ‘non-allergic food hypersensitivity'. you suspect your child has a food allergy or food intolerance as there is a risk of a more severe reaction in the future. 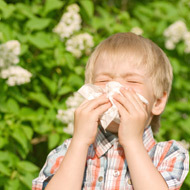 If allergy is confirmed, always be aware of hidden allergens! Never try something new without checking ingredients first! Take extra care with babies and young children. Remember to tell anybody caring for them about their allergies/intolerances and always provide all treatment details, emergency numbers, etc. If an allergy is excluded and intolerance suspected, you could try to avoid the food you suspect for a couple of weeks to see whether the symptoms get better. But then you should still try to reintroduce it later, to see whether the symptoms return. Only after using this avoidance then reintroduction process is it reasonable to avoid the suspect food entirely. To make sure your child's nutrition remains balanced if you decide to avoid certain foods you could consult a dietician. At Richmond Practice we offer evidence-based allergy testing (skin prick tests, blood tests). Our GP and our paediatrician will be happy to assist if you experience these problems.